^ a b B. Carithers, P. Grannis (1995). 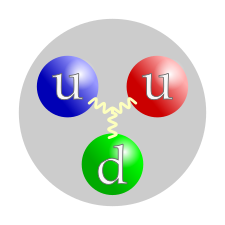 “Discovery of the Top Quark” (PDF). Beam Line (SLAC) 25 (3): 4–16. http://www.slac.stanford.edu/pubs/beamline/25/3/25-3-carithers.pdf 2008年9月23日閲覧。. ^ E.D. Bloom et al. (1969). “High-Energy Inelastic e–p Scattering at 6° and 10°”. Physical Review Letters 23 (16): 930–934. doi:10.1103/PhysRevLett.23.930. ^ M. Breidenbach et al. (1969). “Observed Behavior of Highly Inelastic Electron–Proton Scattering”. Physical Review Letters 23 (16): 935–939. doi:10.1103/PhysRevLett.23.935. ^ K. Nakamura et al. (Particle Data Group) (2010). “Review of Particle Physics: Quarks”. Journal of Physics G 37: 075021. doi:10.1088/0954-3899/37/7A/075021. http://pdg.lbl.gov/2010/tables/rpp2010-sum-quarks.pdf.